CCC Team will be led by Greg Van Avermaet at the first Monument of the season, Milano-Sanremo. The rider will have the company of the core roster for classics. 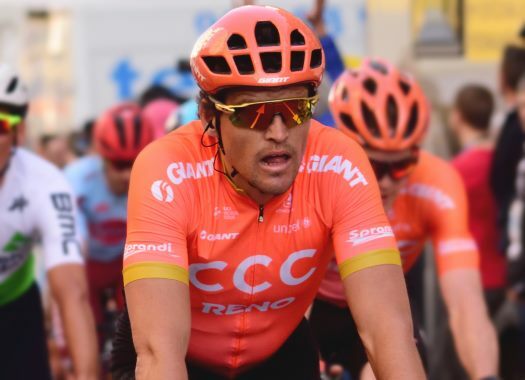 Van Avermaet has started in the race every year since 2008 and 2019 will not be an exception. The race will be 291 kilometres long and its development can be very unpredictable. "The decisive points of Milan-San Remo are the same as usual," explained Sports Director Fabio Baldato. "The Cipressa climb and descent and the Poggio climb and descent are the points where the difference can be made and as we saw last year, Nibali did a great move and avoided a bunch sprint. Most of the time it is a sprint with 30 or 40 riders, but that is the nice thing about the race, it is open for everyone to try something. "Greg Van Avermaet is our clear leader, he is our caption and is looking really good, but we also need to be ready to react to different situations. Alessandro De Marchi is coming in from Paris-Nice with strong form and the guys from Tirreno-Adriatico are also in good shape so we need to be smart and be ready to take every opportunity we get in the race." Van Avermaet is looking forward to the race. "We all know that despite the length of Milan-San Remo, it can be an easy race to finish but one of the hardest races to win," he commented. "It is also one of the most open races in that anyone has a chance if they are still there on the Poggio. I’ve been in the top ten on two occasions and I know I can do a good performance, particularly if we race hard as I can do a good sprint after a long, hard race. Anything can happen at a race like Milan-San Remo so I will give everything I have on Saturday. "I felt really good at Tirreno-Adriatico and I take a lot of confidence from the legs I had at the end of those long stages we did there. It was the perfect preparation race for the upcoming Classics so I think the whole team benefited from the long stages and difficult parcours."